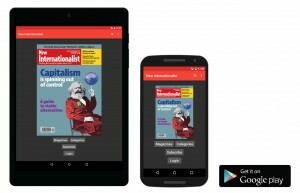 So it’s a huge pleasure for our Co-op to be launching our shiny new Android App for subscribers to the New Internationalist magazine, the magazine that explains – and campaigns on – the big global issues of our time. It’s a huge achievement for our tiny team to have produced in-house all the world-class digital services that our supporters need, so that they can read the magazine in whatever format they prefer. 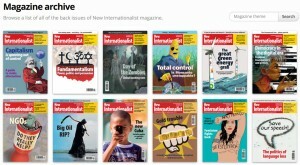 The New Internationalist magazine has won the annual global Independent Media Award for “Best International Coverage” nine times, so the fact that digital subscribers gain access to all the magazines from the past six years is an important bonus, both for research and for gaining a fresh insight into the backstory of current events. – In 2013 we launched http://digital.newint.com.au – the superb browser-based version of our magazine subscription service. – In 2014 we released the popular and convenient iOS App for iPhone, iPad and iPod Touch. – Now we’re delighted to launch the missing link, the brand new Android App for devices such as Nexus and Sony tablets and Samsung Galaxy and HTC phones. The three Apps are all brilliantly integrated, such that if a reader takes out a subscription on the browser-based service, that subscription also works as a login for both of the mobile Apps. So subscribers can access the magazines both on their desktop and on their mobile devices. This entry was posted in Activism, Independent media, Technology and tagged activism, Adroid App, digital subscription, independent media, magazine subscription, New Internationalist magazine by Brian Loffler. Bookmark the permalink.